Fire fighters have warned lives are being put at risk by dangerous parking in Peterborough. 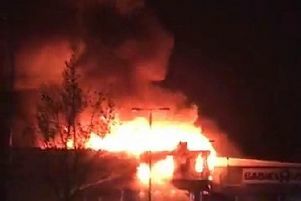 Crews faced problems tackling a fire in Peterborough City Centre early this morning (Thursday) as the fire engine could not get past the parked cars. A fire service spokesman said: “Motorists are urged to take care when parking their vehicles so they do not prevent our fire engines from attending potentially life-threatening emergencies. “A crew from Dogsthorpe was called to a car on fire on Hankey Street early on Thursday morning. Due to vehicles parked inconsiderately around the area, the crew had to park at the Bourges Boulevard end of the street and fight the fire. With this being a dual carriageway, this presented significant safety challenges for the firefighters. “This is a growing problem due to a number of factors, such as thoughtless parking by some motorists, which can be compounded at night.